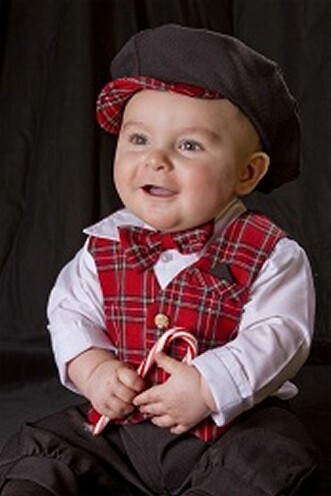 DapperLads - Infants Red Plaid Knickerbocker Set - Knickerbockers - US made Victorian fashion boys knickerbockers sets with genteel nostalgic appeal. **NOTE: The manufacturer has updated the hat and no longer uses plaid material on the brim!. Please see picture below. Page boy style 5-piece infant knicker set. 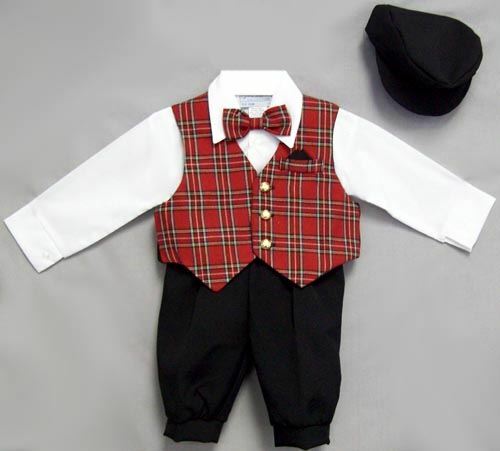 The holiday look features a fully lined red plaid vest with matching clip-on bow tie and solid black cap.. The back of the vest is black rayon. Included in the set is a white cotton poly dress shirt and black knicker pants. The knickers have an elastic back. The set is a nice quality polyester. US made. Machine washable. Sizing Note: This outfit runs small. We recommend you order up one size from what your child normally wears. Please refer to the height / weight chart for more details.